Dual Taper Pushrods from COMP Cams feature a .125'' wall and tapered design for high-strength and lightweight construction. Constructed from a special steel alloy, Dual Taper Pushrods utilize a 210° radius rather than standard 180° radius, which makes them perfect for rocker arms that feature cup type adjusters and applications that demand pushrods with more load bearing surface. The lifter end of the pushrod utilizes the standard 3/8'' 180° ball end. 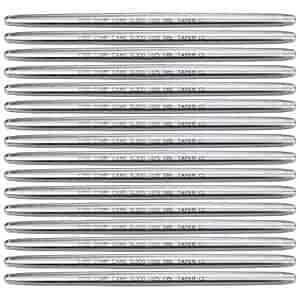 All Dual Taper Pushrods are finished with laser-etched length and part numbers for easy identification.